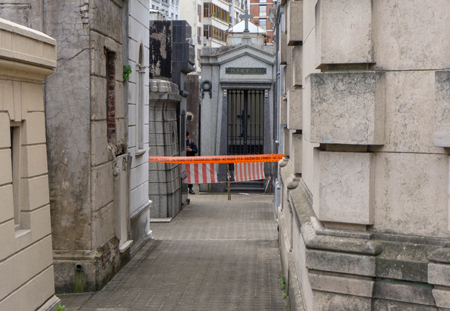 As a rule, important families placed their mausoleums along the wider walkways of Recoleta Cemetery for maximum impact… but of course exceptions exist to every rule. 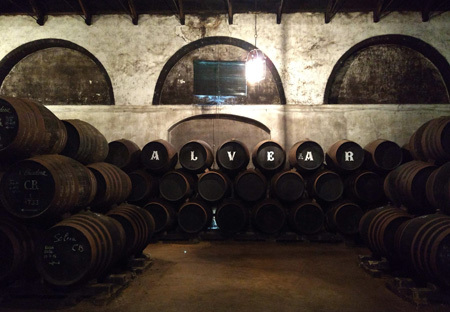 Perhaps no other space was available at the time of construction, but that didn’t mean this branch of the Alvear family couldn’t build on a grand scale. Just not as many people discover it today. 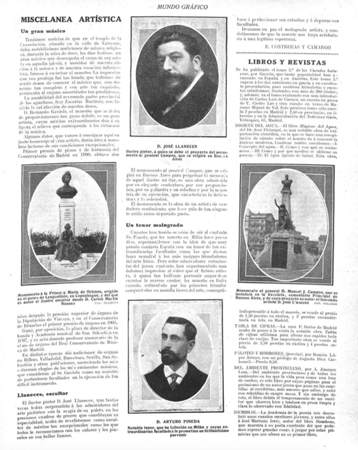 Diego Estanislao de Alvear came from a long line of Argentina’s founding fathers. 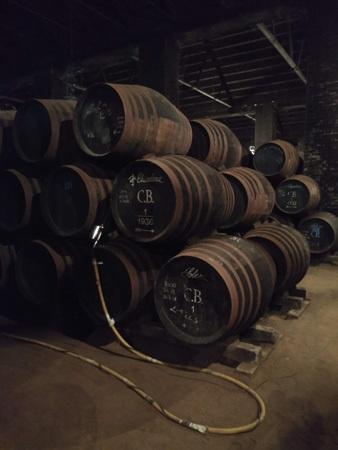 The family hailed from Andalucía where his great-great-grandfather founded the famous Alvear winery in Montilla (near Córdoba, photos below). 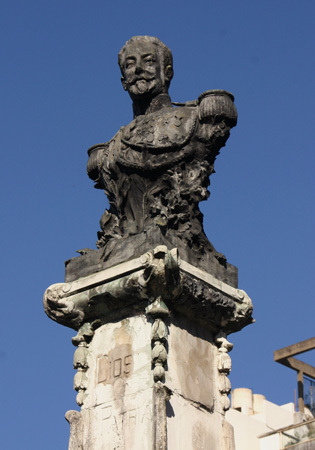 Diego’s grandfather held a high position in the Viceroyalty of the Río de la Plata & defended Spain against the forces of Napoleon in Cádiz, after losing most family & possessions when the frigate Mercedes was sunk by British naval forces. Diego’s father, Carlos María de Alvear, was not on board the Mercedes & went on to help Argentina proclaim independence from Spain. He’s buried at the entrance of the cemetery for all to see. Diego de Alvear passed away in 1887 after marrying into an even richer family, founding the Club del Progreso & serving in the Senate. 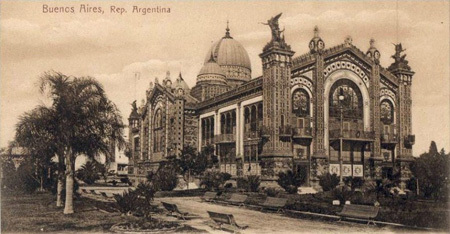 The family hired French architect Albert Ballu to design their grand mausoleum in 1889, who would also be responsible for the Argentina pavilion at the World Expo in Paris that same year. 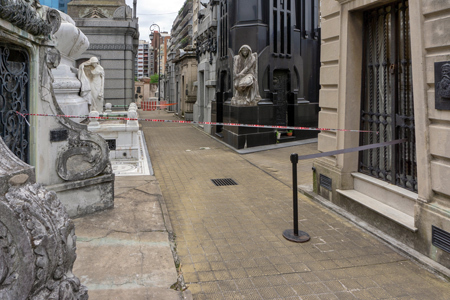 So grand & inspiring, the pavilion was deconstructed, shipped to Argentina & rebuilt on Plaza San Martín to become a new home to the Museo de Bellas Artes in Buenos Aires. The family certainly knew how to pick the most popular architect for the time. 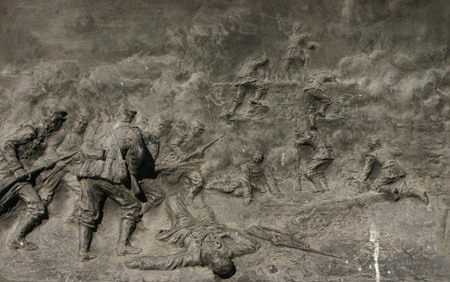 Even more surprising is the interior sculpture, difficult to appreciate due to the mausoleum’s doors. But take a peek inside. Signed by Jules Roulleau in 1889, four figures of women in mourning surround a bust of Diego de Alvear. Some sources claim them to be sisters, but since he only had three they are likely allegorical representations of sorrow. 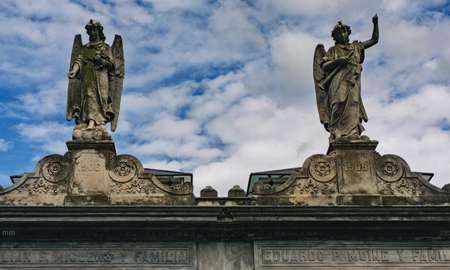 More photos of this fantastic & forgotten mausoleum on Alejandro Machado’s blog dedicated to French architects in Argentina. One of 17 children—four destined to occupy high-ranking positions in the military—Manuel Jorge Campos participated in many of the major events of his day. 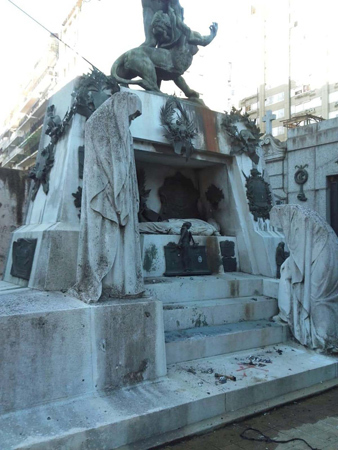 Breaking from the influence of older brother General Luis María Campos & establishing a distinguished career of his own, the current condition of Manuel’s tomb suggests that history has perhaps forgotten his many contributions to Argentina… just compare with Luis María five mausoleums away. 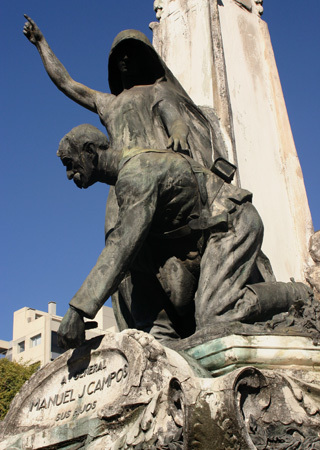 He also helped squash the several rebellions of Buenos Aires against the national government as well as assisted Julio Argentino Roca in the fight to acquire land from the indigenous population in 1879. But his most historic claim to fame is a still-unconfirmed conspiracy which made the 1890 Revolution against the national government fail. Manuel Campos conspired with revolutionaries, gained their trust & became their military leader. Arrested & jailed shortly before the day of attack, President Roca visited Campos in his cell… historians believe some sneaky plans formed as a result of that meeting. Born in 1788, Tomás Guido witnessed or participated in almost every major event during the creation of Argentina as an independent, new nation. He started young, defending Buenos Aires from both British invasions in 1806 & 1807 at the age of 18. Guido later accompanied Mariano Moreno on a diplomatic mission to the UK & was on board when Moreno passed away at sea. During independence wars, Guido traveled to Tucumán where he became a secretary & befriended both José de San Martín & Manuel Belgrano. 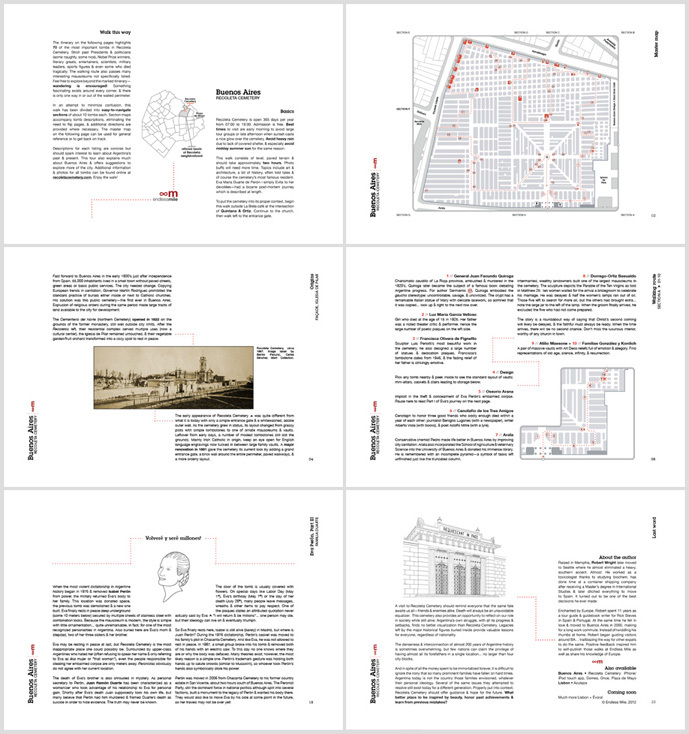 Memoirs of his time with San Martín became an invaluable historic document, published in 1816. Over time, he would advance in rank & participate in the liberation of what we know as Chile & Perú. 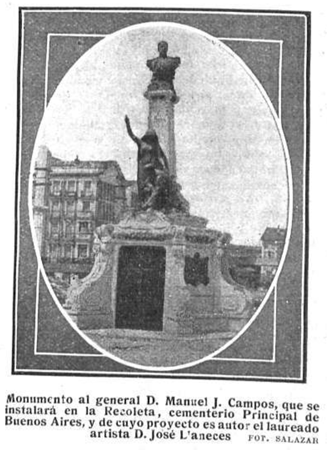 Returning to Buenos Aires, Guido worked with the Rivadavia government during the war with Brazil. 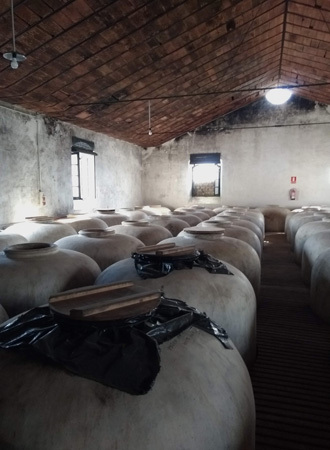 He continued to be appointed by successive leaders such as Manuel Dorrego, Juan Lavalle, Juan José Viamonte & surprisingly by both Juan Manuel de Rosas & Justo José de Urquiza at different moments. Usually involved in diplomacy & international relations, Guido passed away in 1866 in Buenos Aires after negotiating a peace agreement between Paraguay & the United States just a few years prior. His last wish was to be buried in the Andes, in remembrance of his time fighting for South American independence. 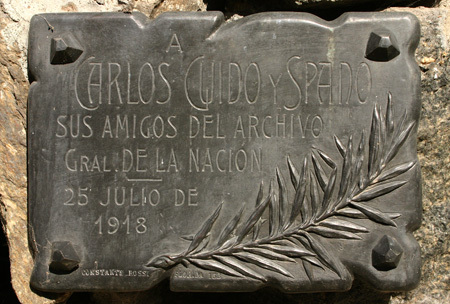 An important figure in his own right, Carlos Spano y Guido & his descendants remain buried here. Guido y Spano wrote well-received romantic prose & became director of the National Archive (plaque below dedicated to his passing). 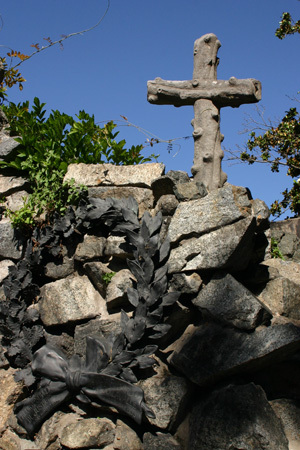 He also worked to found the Sociedad Protectora de Animales with José Pérez Mendoza. 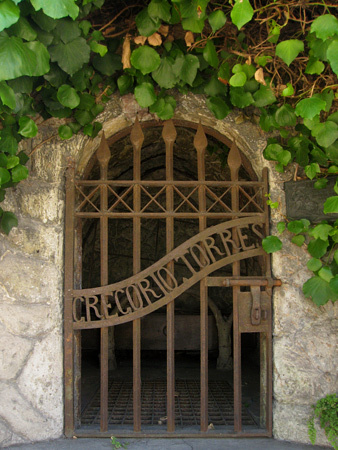 In 1946, this tomb was designated a National Historic Monument by the Perón government. Beautiful panel signed by M. Pla y Vilar. Remember that morning & sunset are the best times to peek inside mausoleums to find these gems. 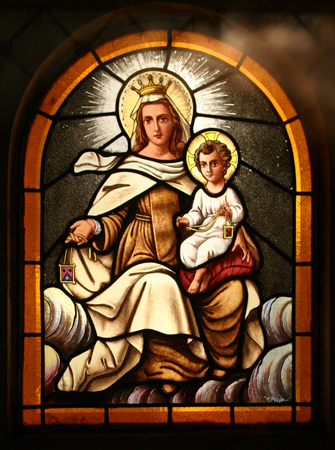 To see more examples, type “stained glass” into the search bar. Happy holidays to everyone, & thanks very much for all the support this year. 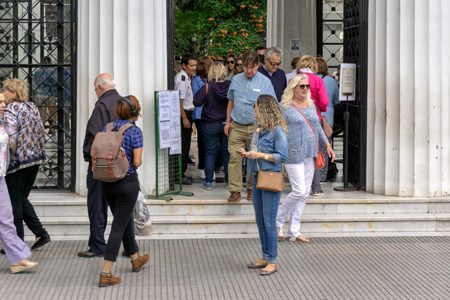 Hope you’ve enjoyed Recoleta Cemetery as much as we do! The story wasn’t difficult to put together. The injured woman, 34-year old Anahí Esperanza Salcedo, had been responsible for the bombing & suffered facial damage as well as the loss of three fingers when the device exploded early… apparently while taking a selfie. 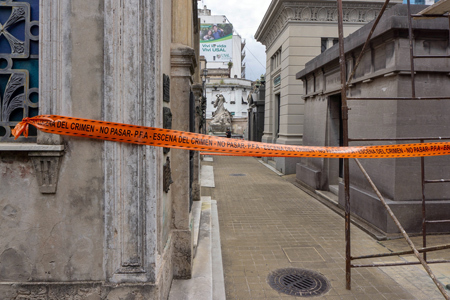 Salcedo entered the cemetery with Hugo Alberto Rodríguez, both disguised with wigs & sunglasses. They identify as anarchists & wanted to destroy the tomb of Falcón, who had been assassinated by an anarchist 109 years ago. 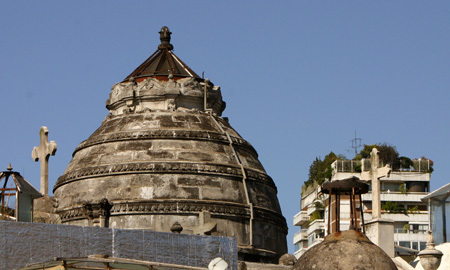 In the end, the tomb survived while Salcedo remains in critical condition. Police officials consider this crime linked to another pipe bomb thrown into the front patio of the home of judge Claudio Bonadio later that same day. Bonadio is currently investigating charges of bribery & money laundering involving members of the previous government, including former President Cristina Fernández de Kirchner. 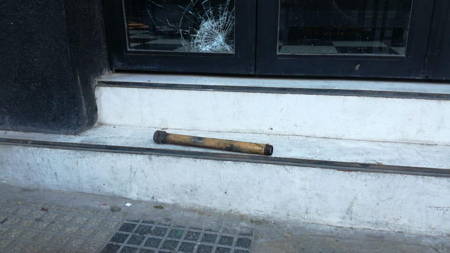 The following day federal police raided the anarchists’ base of operations in the Buenos Aires neighborhood of San Cristóbal & arrested 10 individuals after finding material used to make pipe bombs. 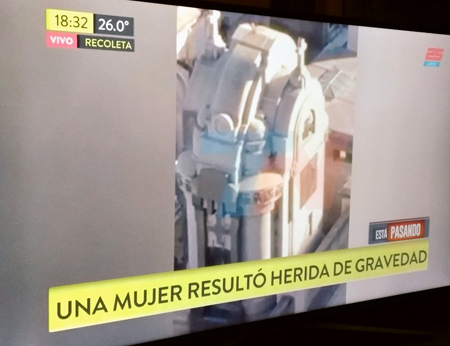 During 19 years of visiting & documenting Recoleta Cemetery, neither Marcelo nor I ever imagined this kind of violence taking place inside. 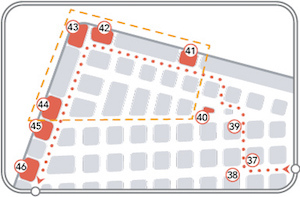 Some speculate that it may be an attempt to disrupt an otherwise calm city preceding the G-20 summit. 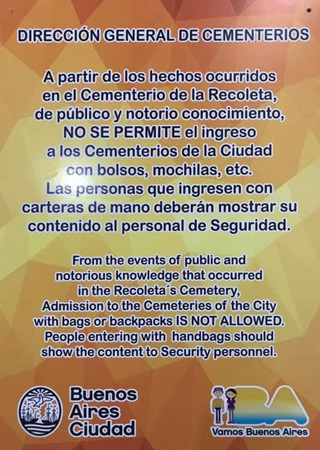 Whatever the reason, one lesson that Recoleta Cemetery demonstrates through almost 200 years of history is that violence is never the means to an end. And you can’t kill someone twice!